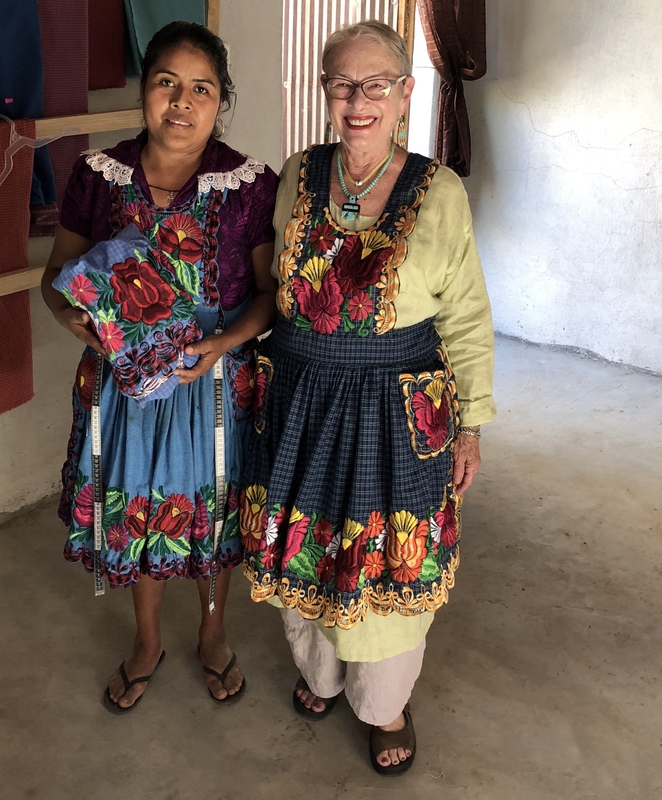 Susie’s traveled with Oaxaca Cultural Navigator to Tenancingo de Degollado to explore the ikat weaving and rebozo making culture of Mexico. 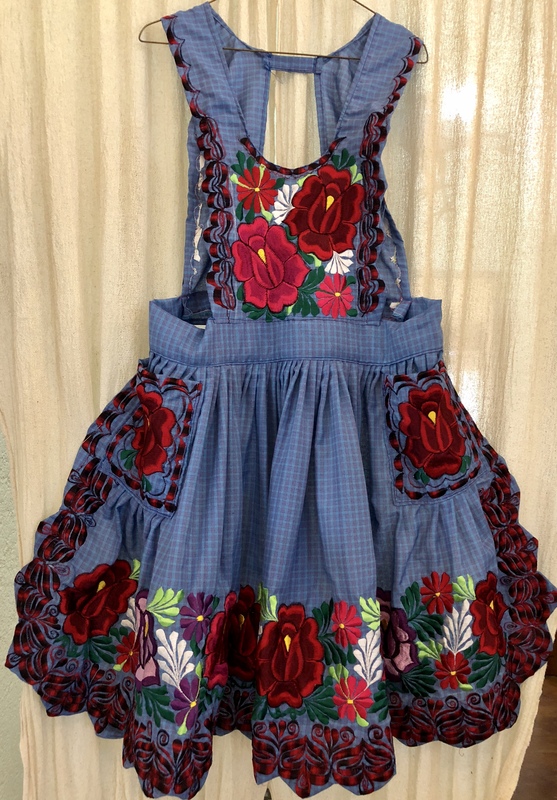 She has since returned with us to other parts of Mexico, including Chiapas and the Oaxaca Coast. 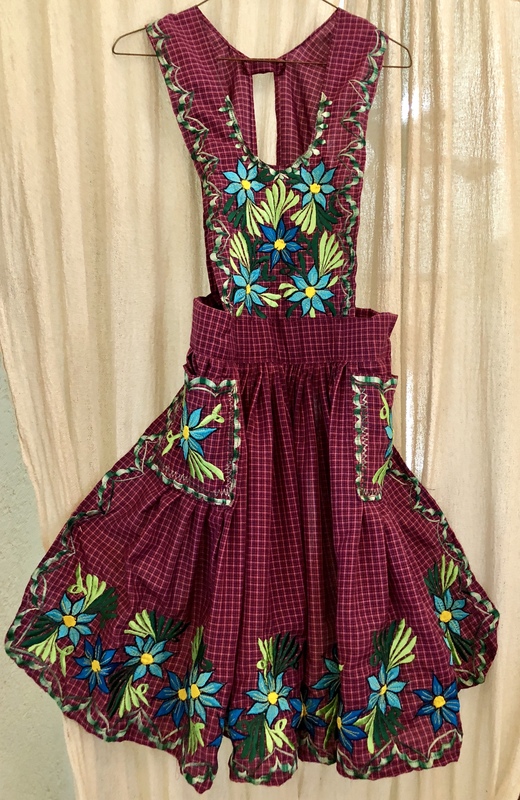 Meanwhile, on that trip she picked up a few beautiful pieces she hasn’t yet worn and after seeing that I was helping Leslie sell her regrets, asked me if I could try to resell these for her. We know the provenance! #1. 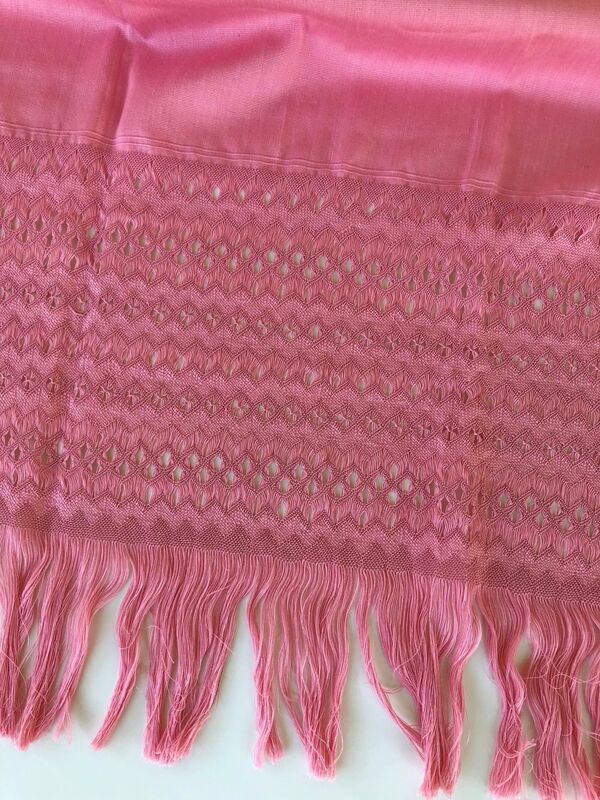 Rose Rebozo. 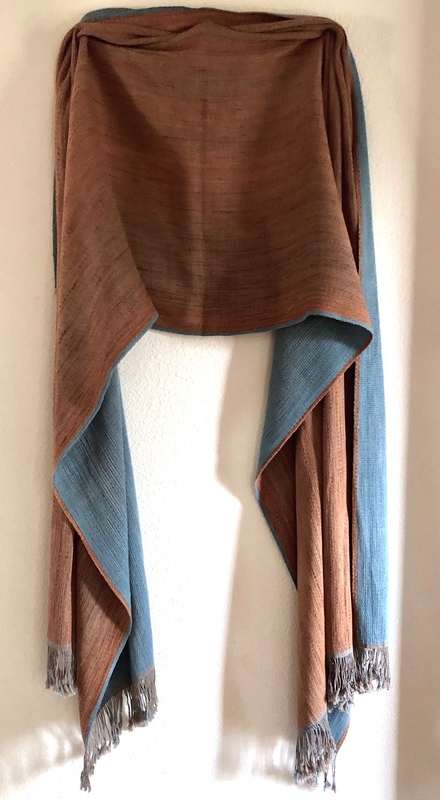 This rebozo, or fringed shawl, is hand-woven on a flying shuttle, four harness loom in Tenancingo de Degollado, Estado de Mexico (State of Mexico) by one of the finest weavers in town, Jesus Zarate. 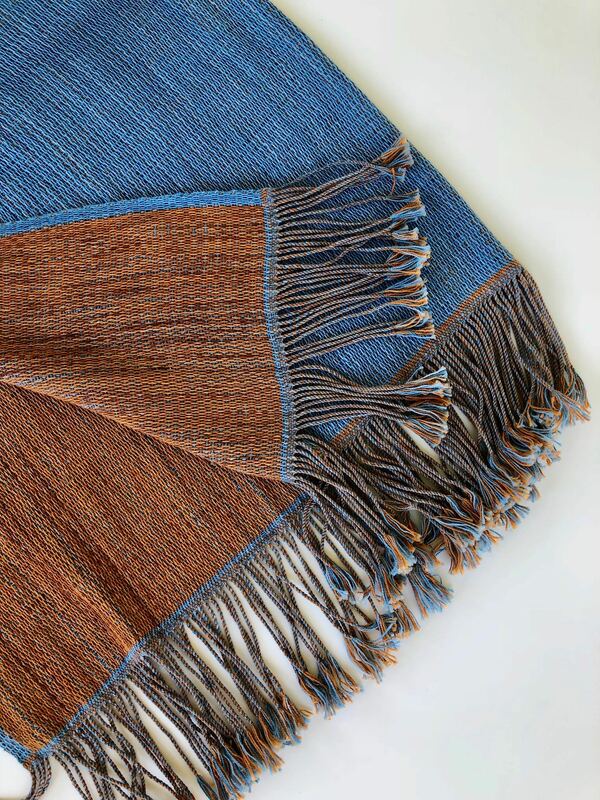 What makes this textile most remarkable is the fringe. 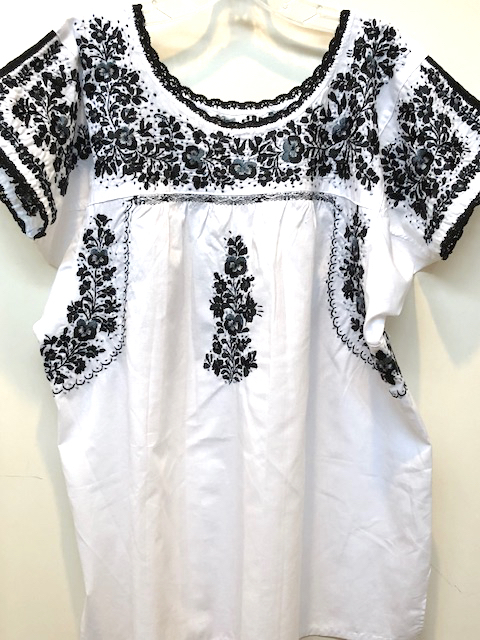 It is completely hand-knotted by Fitalina, considered to be the greatest puntadora or fringe-knotter in all of Mexico. 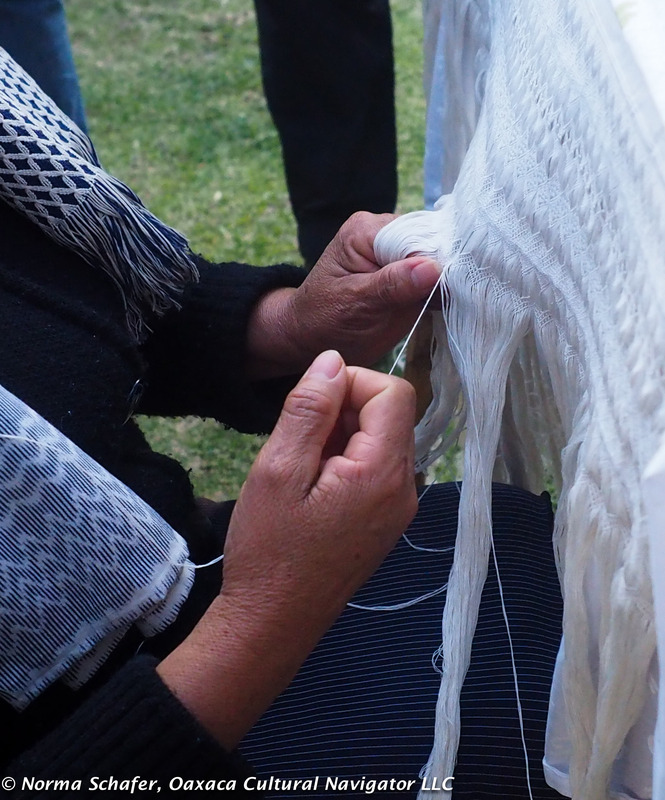 It took her three months to make this luxurious fringe after the weaver sold her the fine cotton hand-woven cloth. 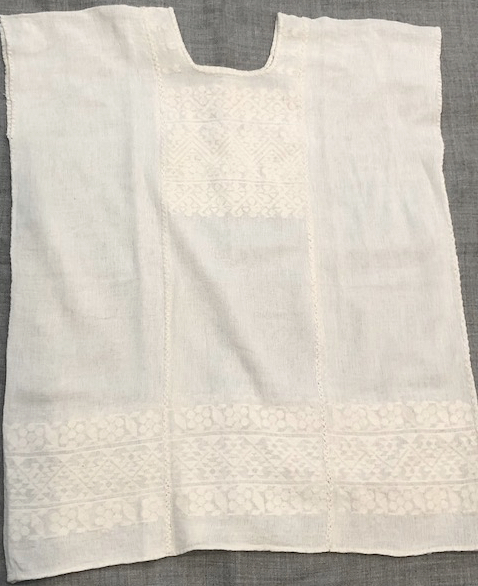 This is a large shawl, called a Chalina because it has no pattern in the cloth, is akin to what Frida Kahlo preferred, and is part of Mexican female identity. 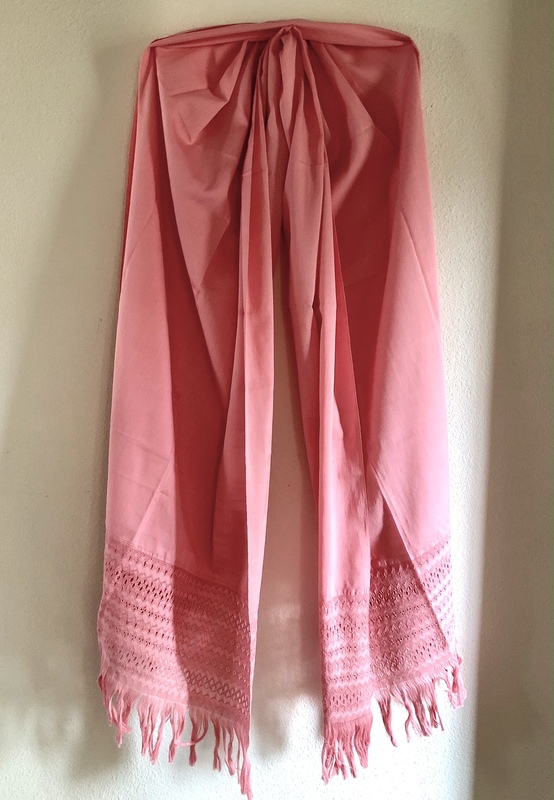 It measures 90″ long (including the fringe) and 29″ wide. 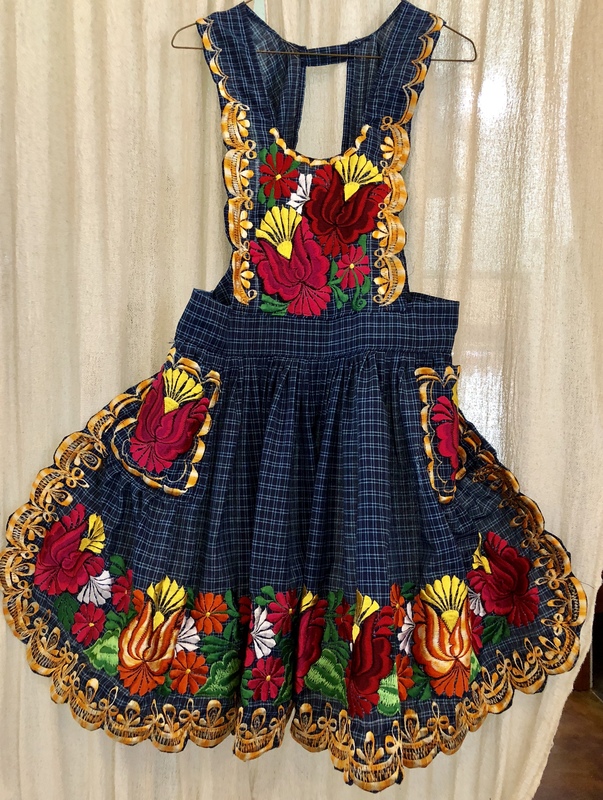 This exceptional piece is $335 USD. 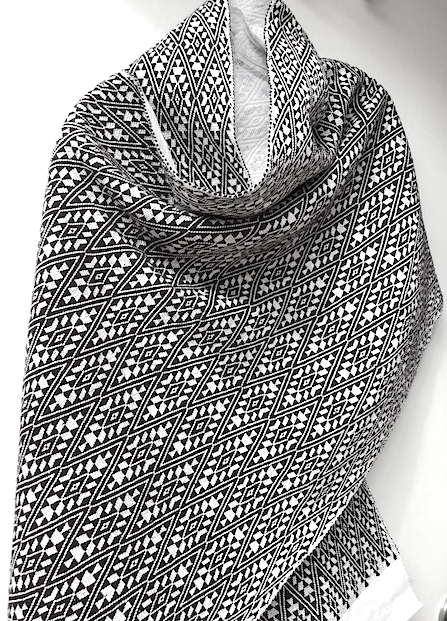 Price includes mailing via USPS Priority Mail to anywhere in 48 U.S. states. This group will be mailed from a remote corner of Northern California in the Lake Shasta region. #2. 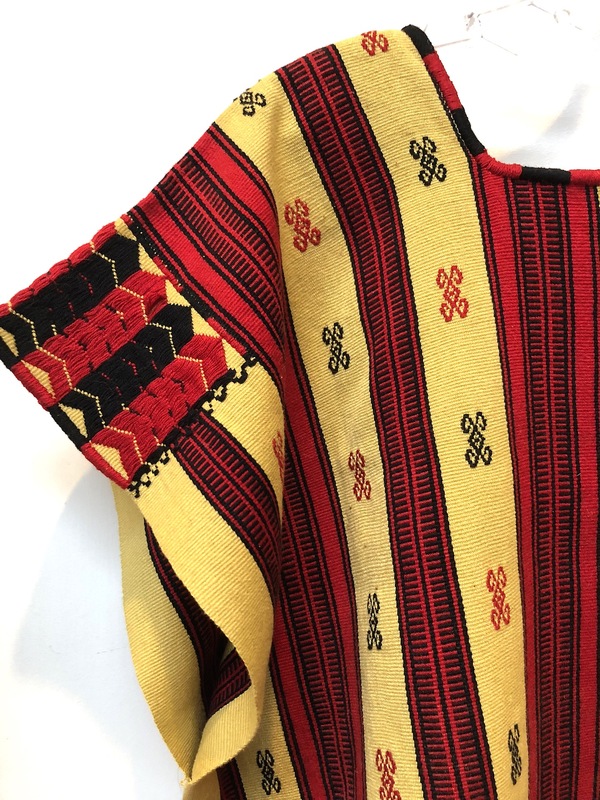 This rebozo was commissioned by the famed Remigio Mestas of Oaxaca, who works with the finest back-strap loom weavers in villages throughout the state. 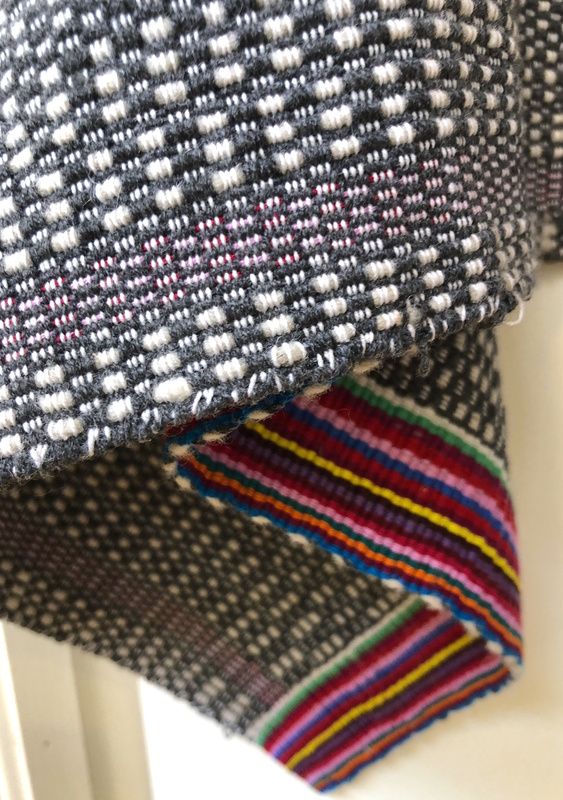 This is a double-faced weave, soft and cozy cotton, difficult to execute, woven by Maria Teodora from the Sierra Mixe Alta. 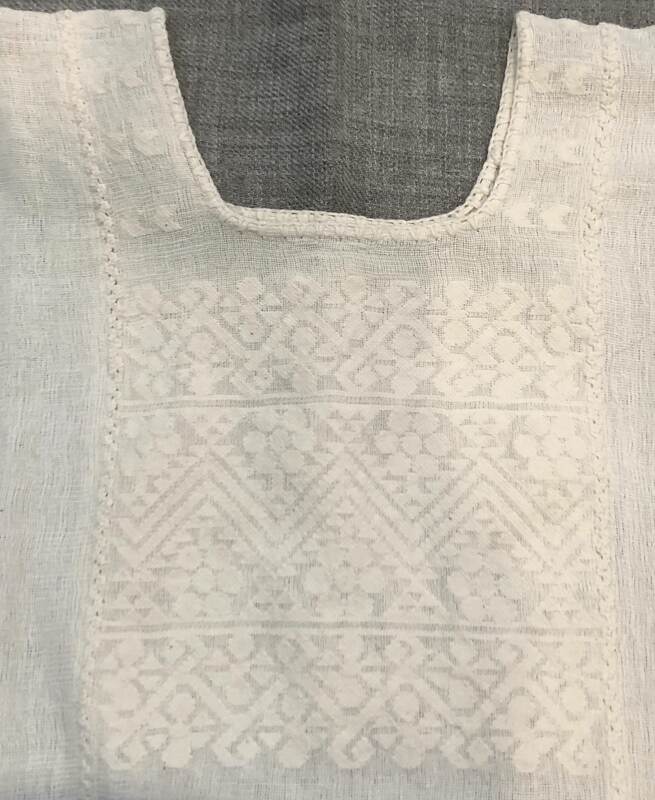 One face shows indigo blue natural dye. The red-brown rust color on the second side is achieved with encino or red oak. 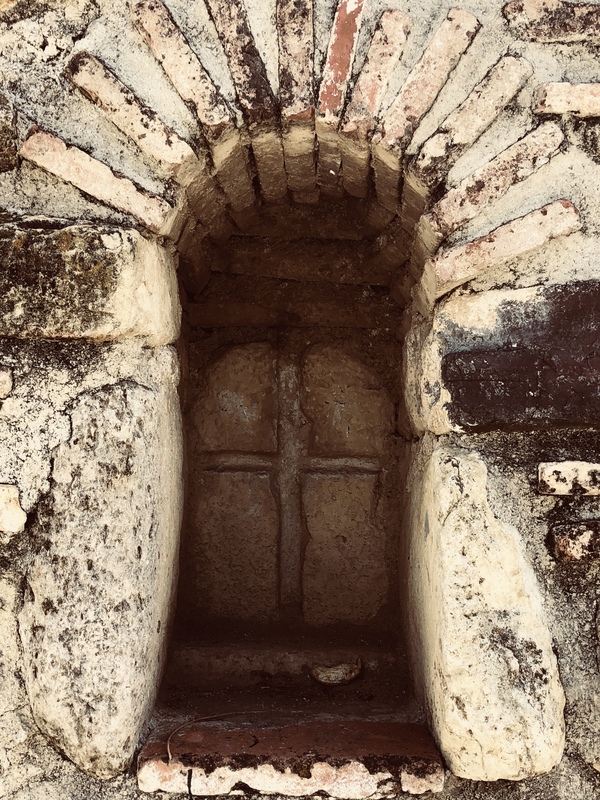 The Sierra Mixe region of Oaxaca is about eight hours from Oaxaca city on the way to the Pacific coast, high in the mountains. 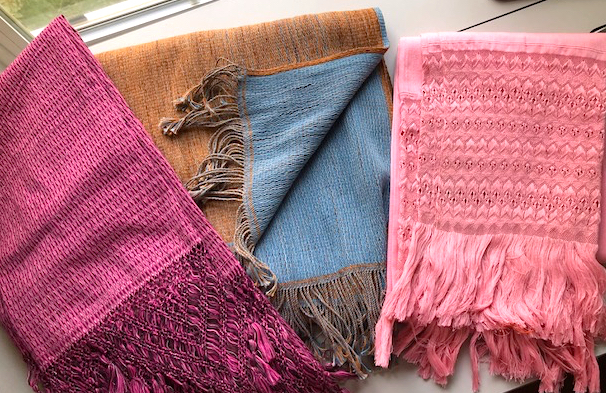 Fringes are hand-twisted. 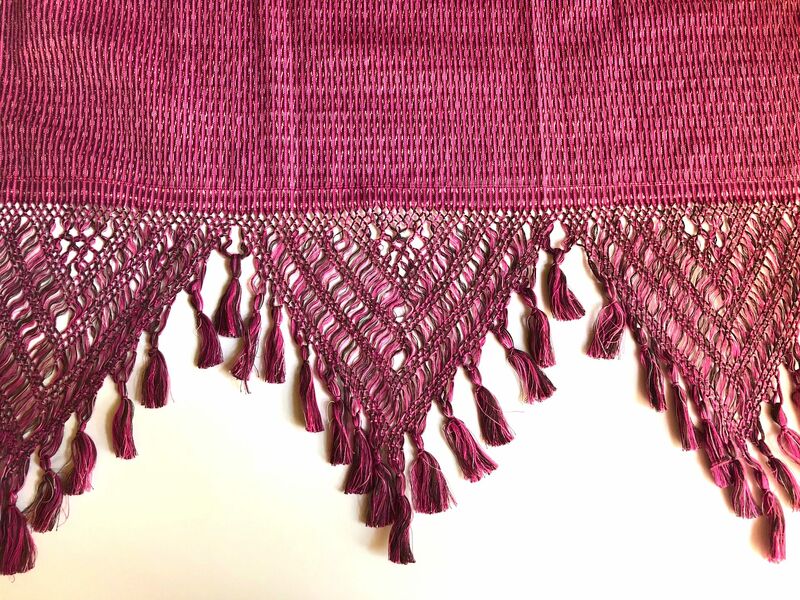 It measures 102″ long (including fringe) and 29″ wide. $345 USD and includes USPS priority mailing to continental 48 U.S. states. #3. 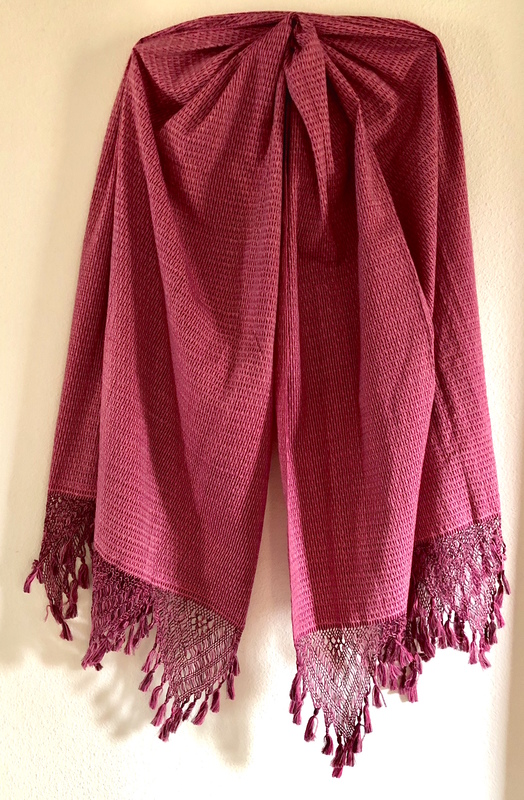 This Magenta Rebozo is from the Xoxopastli studio in Malinalco operated by designer Camilla Ramos, famous throughout Mexico for her intricate ikat rebozos and Colonial-style puntas or fringes. It is among the finest workmanship in the country. 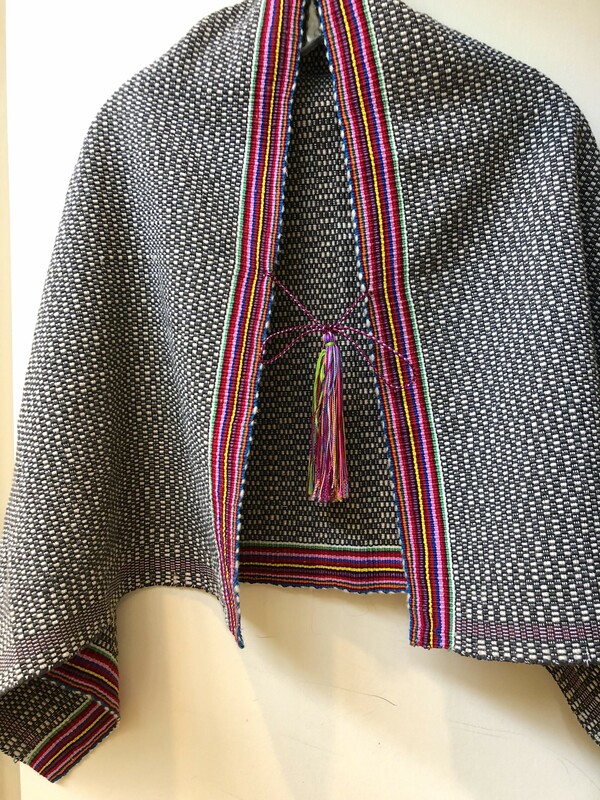 This one is woven on the four-harness flying shuttle loom. 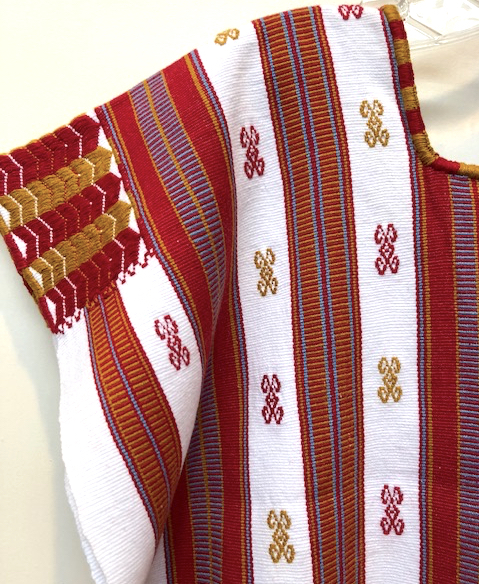 Ikat is achieved by dyeing the warp threads. 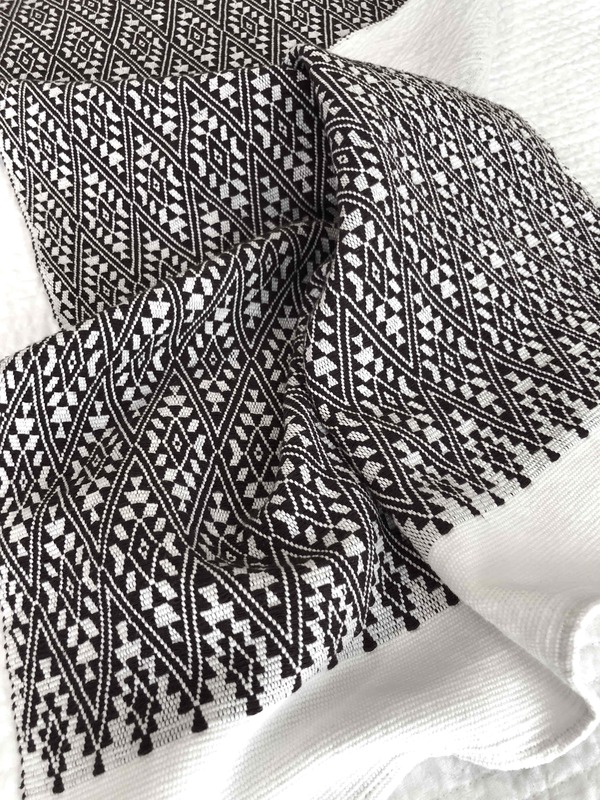 Every one of the 6,000 threads of the warp must be exactly on register for the pattern to match up. 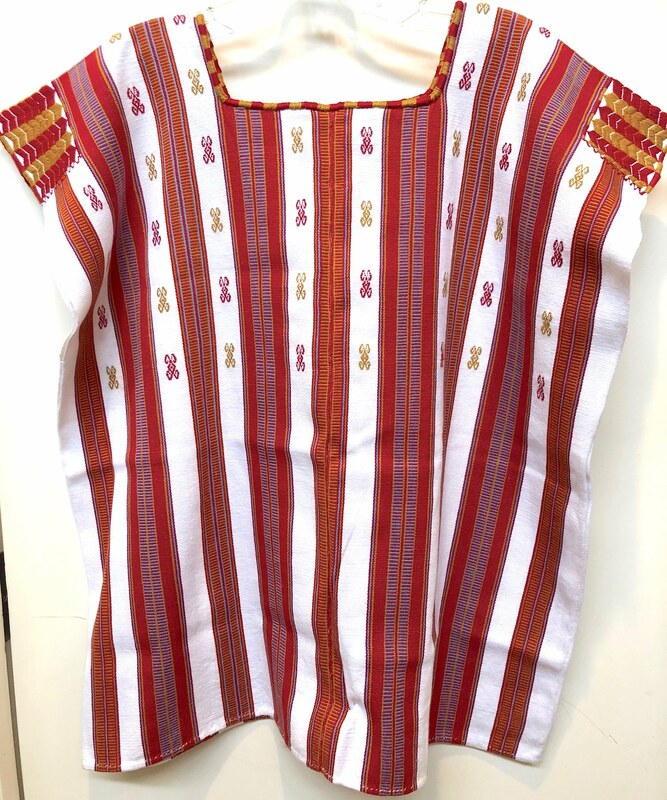 This pattern is called Chispas and is created from brown, hot pink and white cotton threads. It measures 80″ long (including the fringe) and 29″ wide. 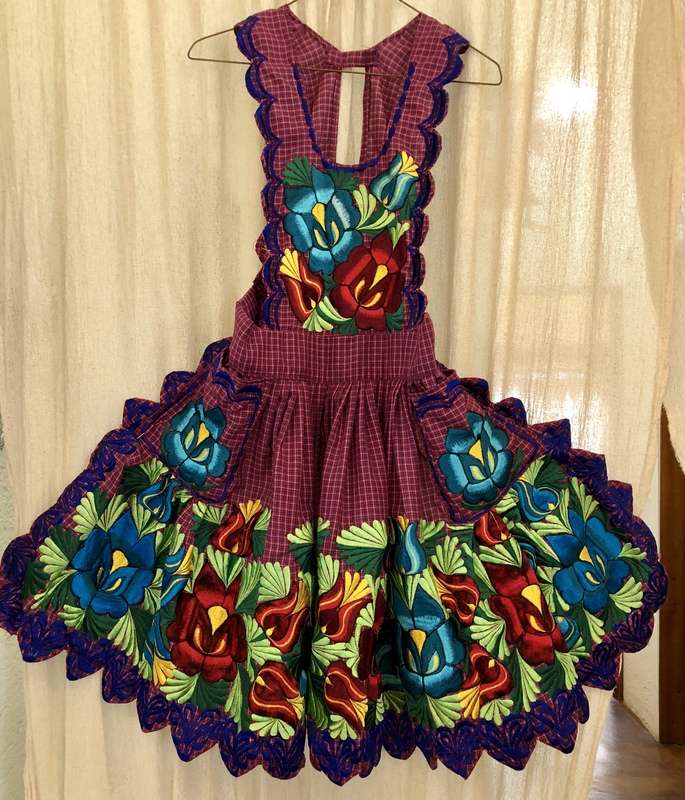 Cost is $225 USD including mailing via USPS priority mail to anywhere in 48 US states. 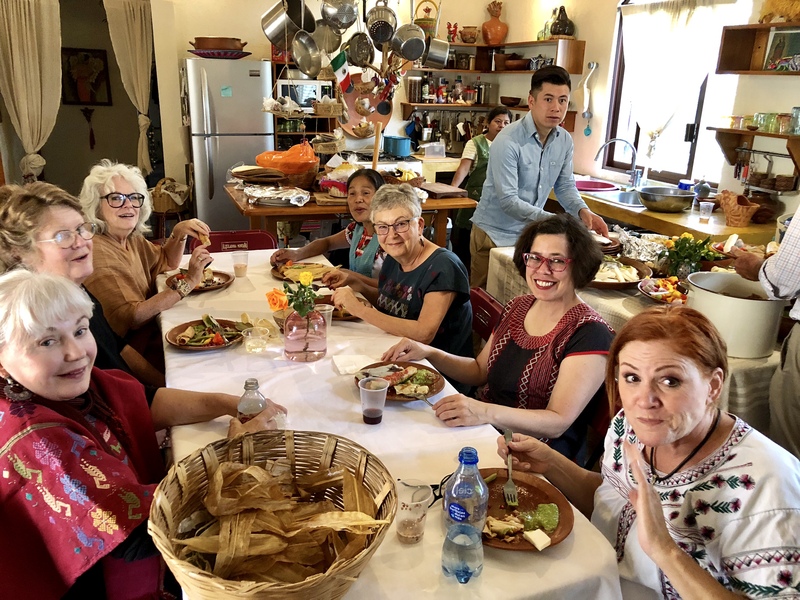 It’s not likely I will take another group to Tenancingo, so this may be your best chance to get as close to the source as possible! 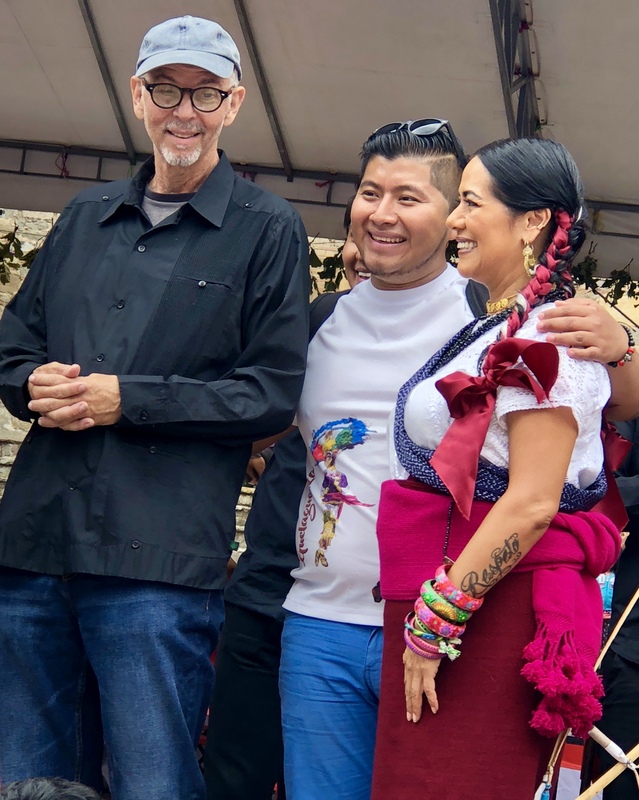 It’s been a week since the new Community Cultural Center debuted on August 18, 2018 with a grand opening event. It was spectacular! 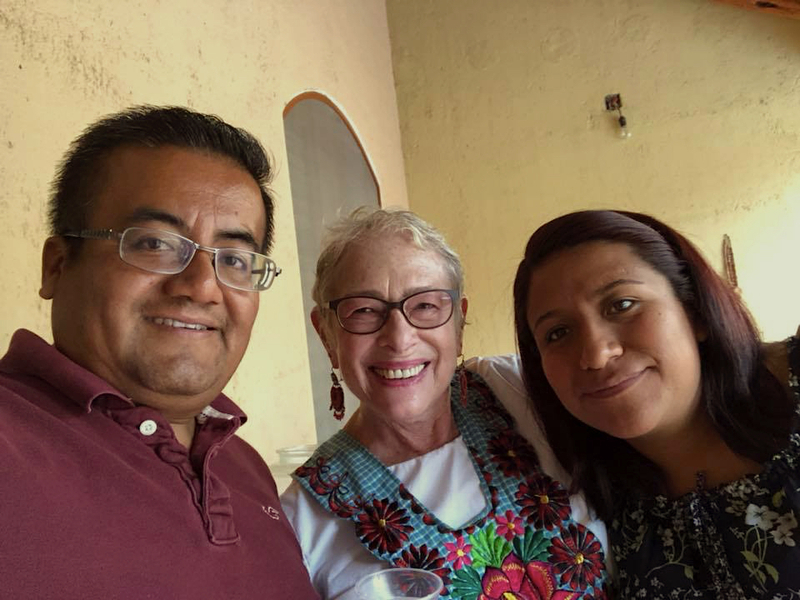 What I love about the new Centro Cultural Communitario is it’s tri-lingual explanation of village life and values in Zapotec, Spanish and English. 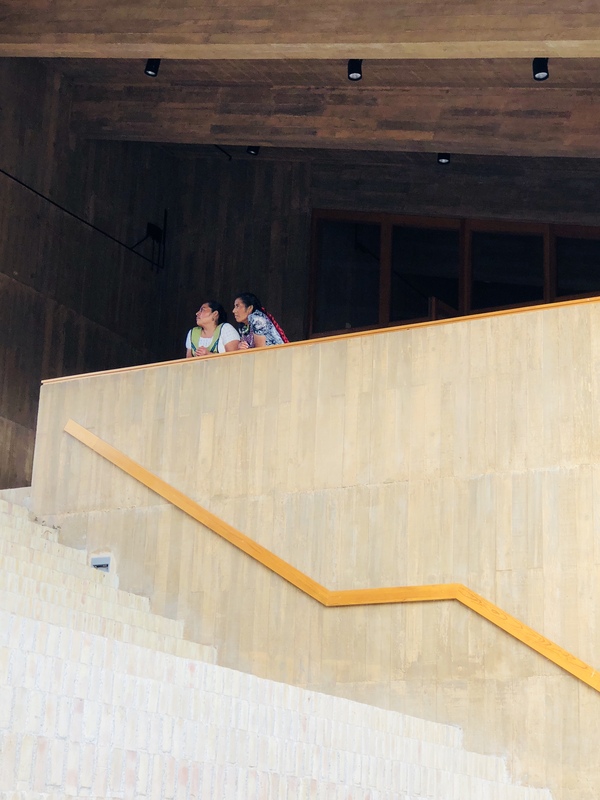 I also love the simplicity of PRODUCTORA’s architectural design that brings past into present. 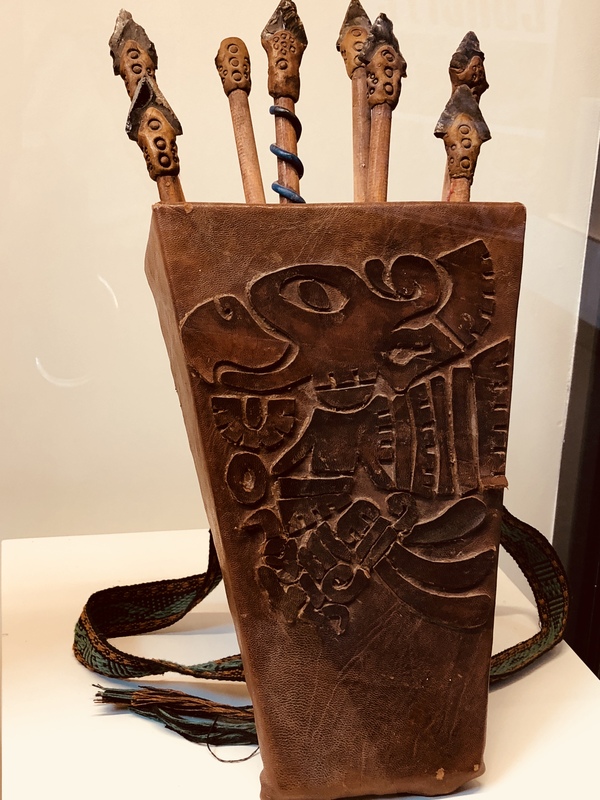 The center explanations begin with a discussion about what is on display, exploring three core themes: indigenous customs and uses (usos y costumbres), artisanal production, and celebrations and ceremonies. The grand plaza that joins old adobe and modern concrete. I don’t think we can talk about cultural heritage without addressing the issue of cultural appropriation. 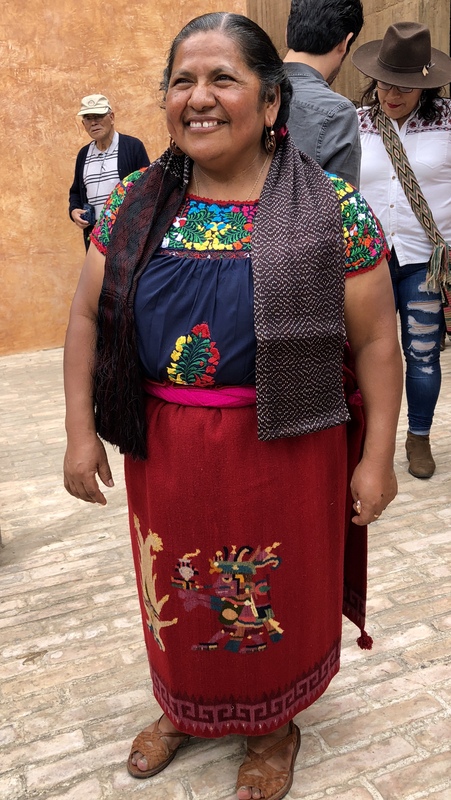 This is an important topic in Oaxaca and worldwide when the dominant culture adopts elements of the minority culture, often for commercial benefit without recompense to the originators. 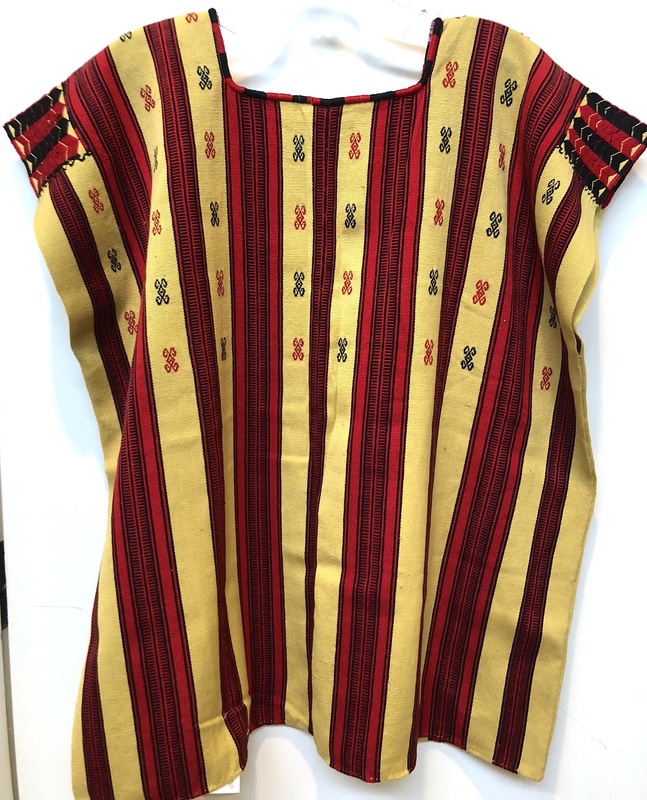 “The array of tradition-based creations such as worldview, mythology, usos y costumbres, language, literature, music, dances, games, ceremonies, and crafts, among others, constitute the intangible cultural heritage also known as a living heritage,” they say. 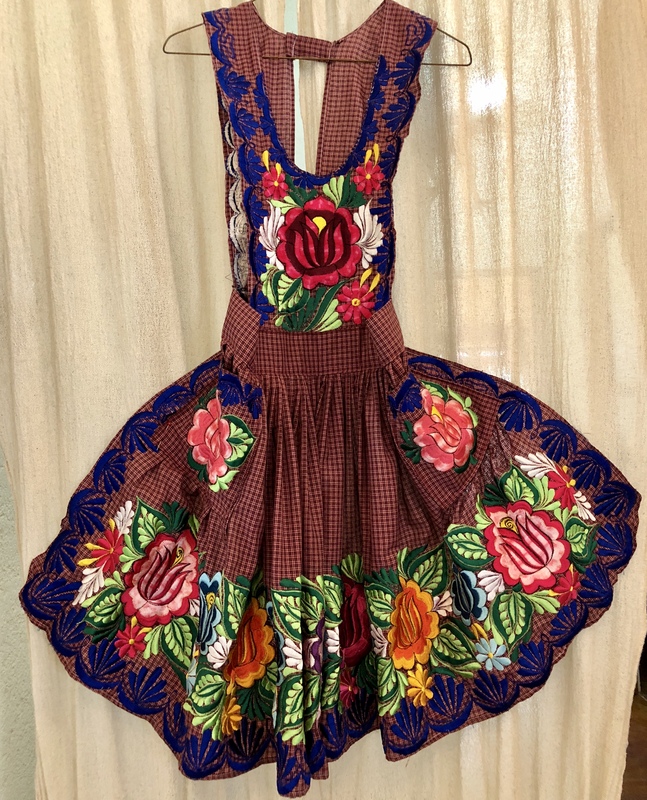 The Grand Opening featured traditional dances, including the Jarabe del Valle from this Tlacolula de Matamoros ensemble. 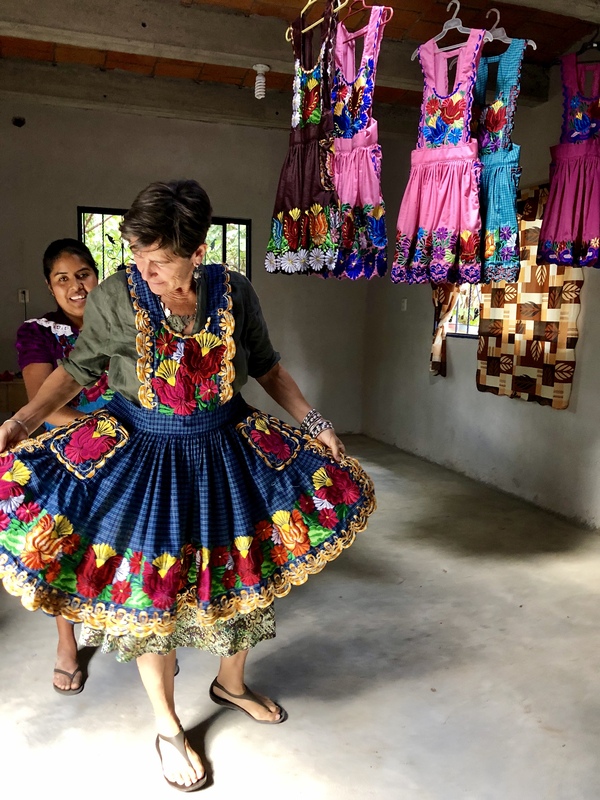 The dance is part of every village festivity, especially weddings, quinceanera’s and birthdays. 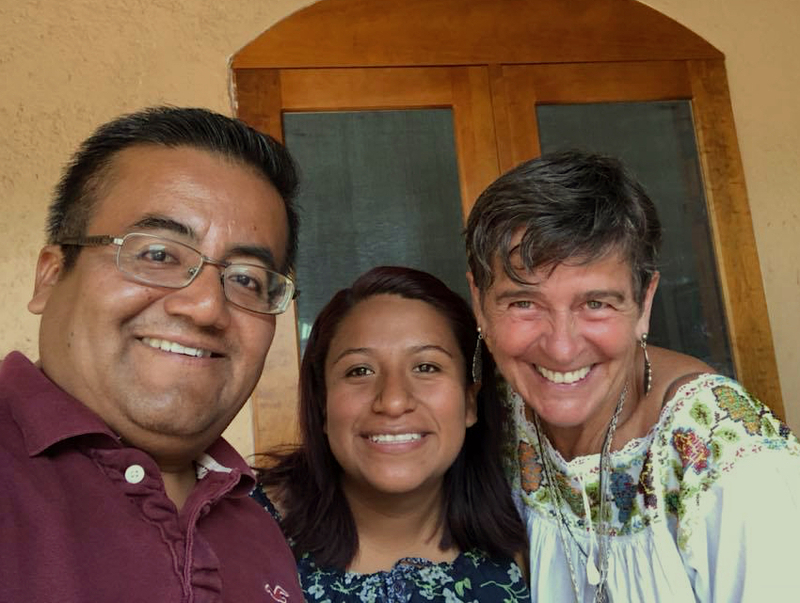 For me, an important reason to live and celebrate life in Teotitlan del Valle is all bundled up in an ancient, deeply rooted history of thousands of years. 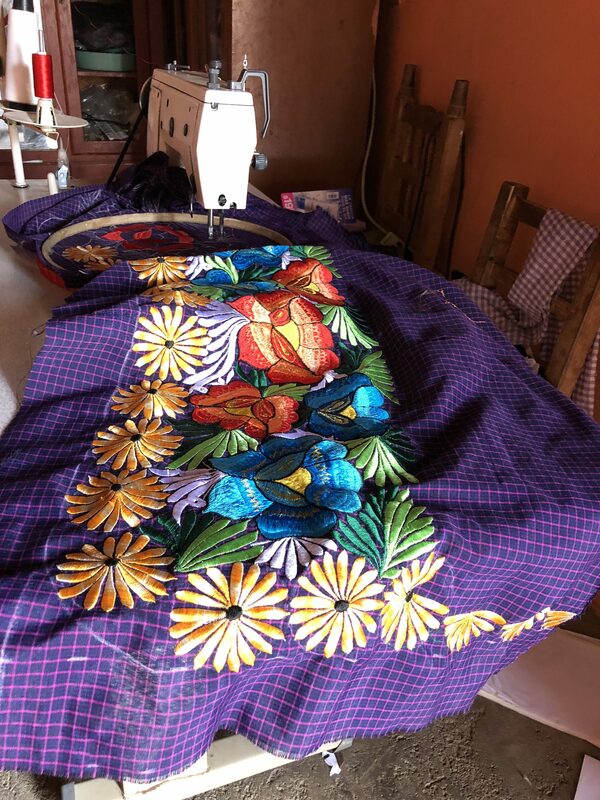 More than having survived, Teotitlan del Valle has thrived because her people have innovated, adapted, changed and evolved while continuing to honor and respect tradition. At the core of this is the family and community. 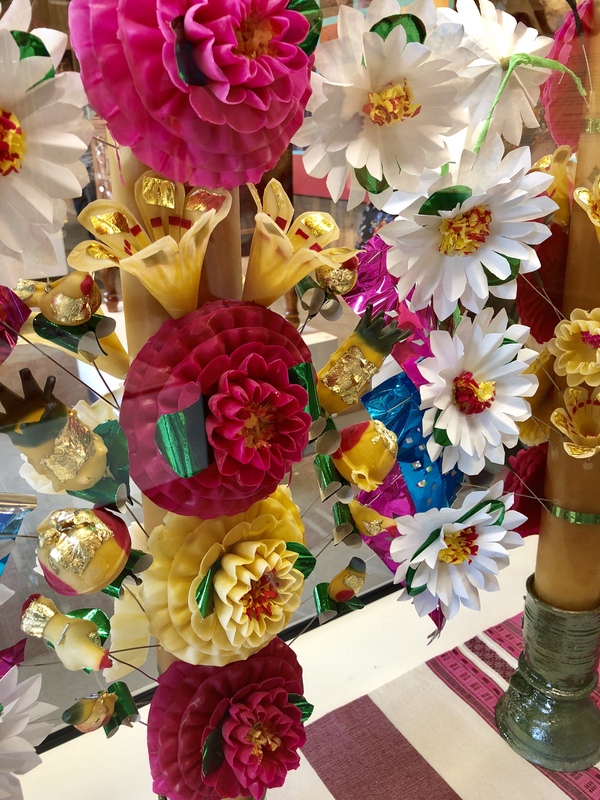 On display are the hand-made beeswax candles from the family of Grand Master of Oaxaca Folk Art Viviana Alavez Hipolito. The work passes through the generations. Women who marry into the family learn and do it, too. It is not merely decoration. It is part of ceremonial life. Church and home altars are festooned with these candles. 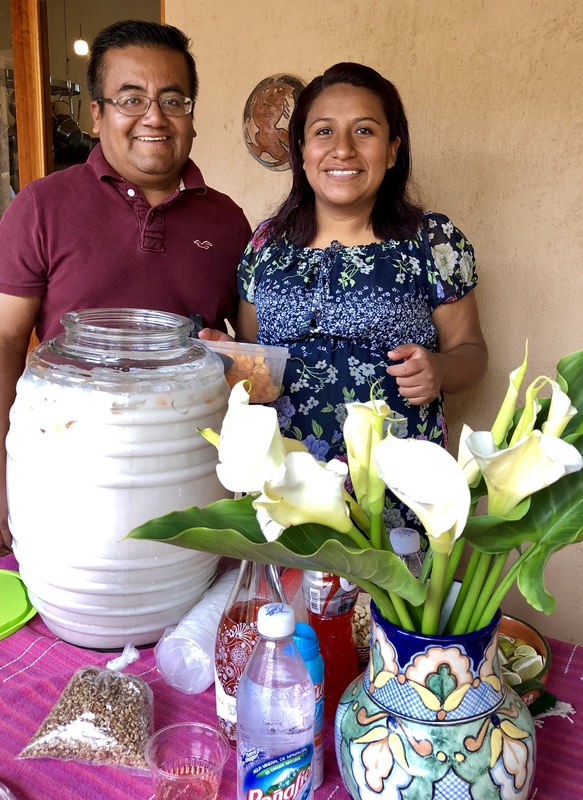 Only three candle makers remain in Teotitlan del Valle. A highlight of the space are videos of traditions, practices and examples of life. 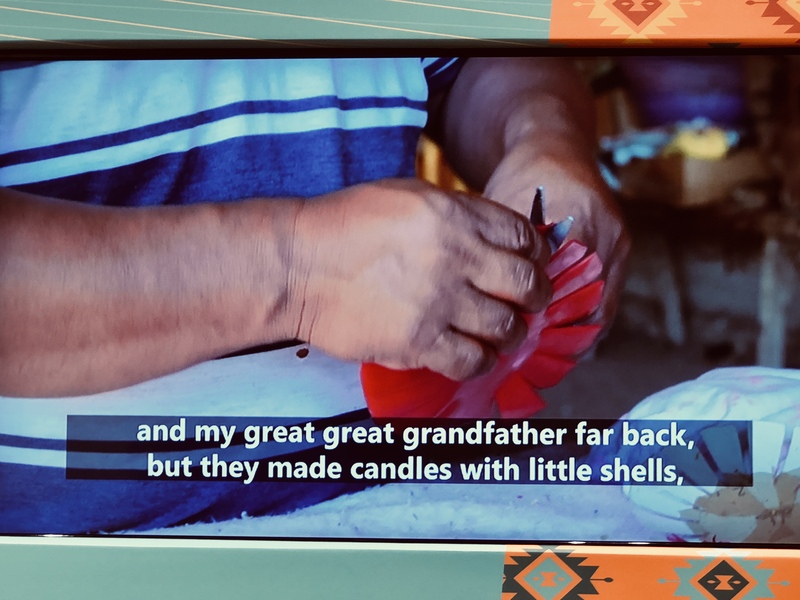 All the videos have English subtitles, a nod to the value and importance of English-speaking visitors to Teotitlan del Valle. It helps us understand more! How well do we teach our children who we are, what we value? In many traditions, continuity depends on how well we inculcate values and practices in our children. 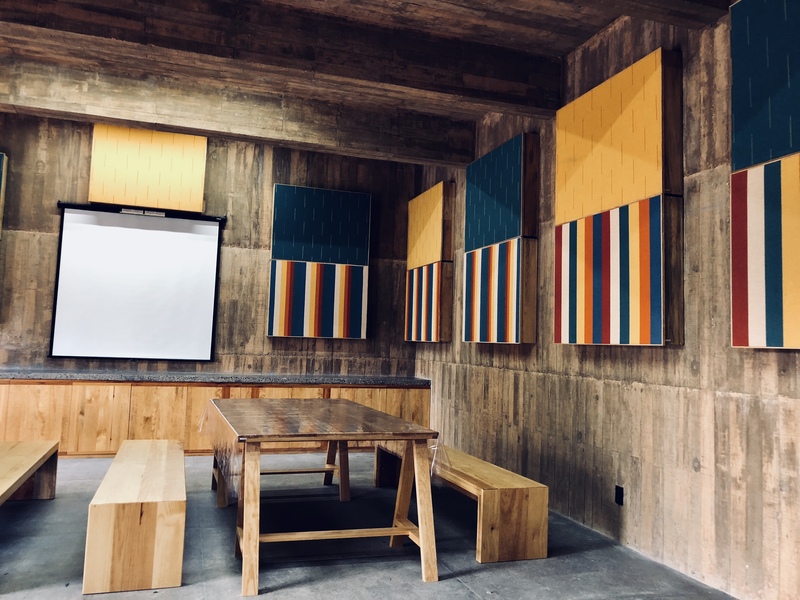 The community cultural center does more than show and tell visitors — nationals and foreigners — about essential practices. It says to local children that they can be proud of their heritage and make a commitment to carry it forward. 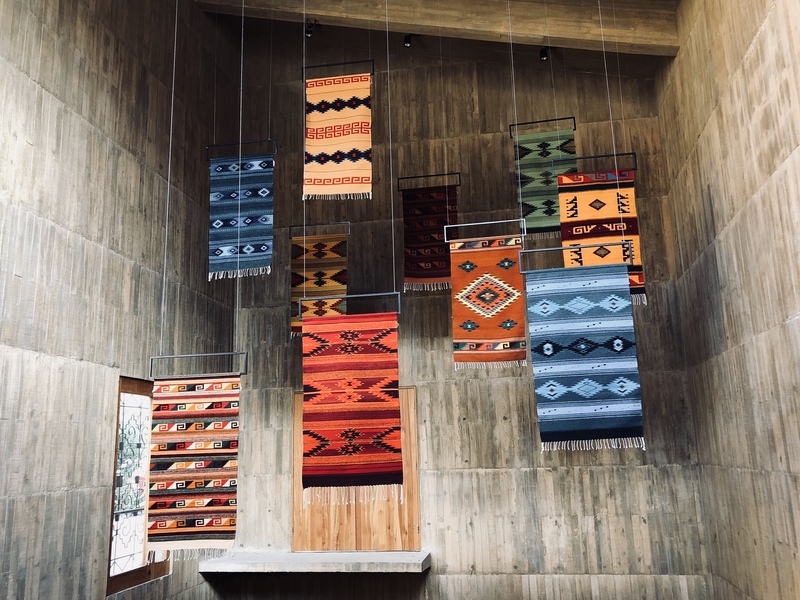 The process of using natural dyes on wool to weave tapestries on the two-pedal loom is part of the cultural center exhibit space. 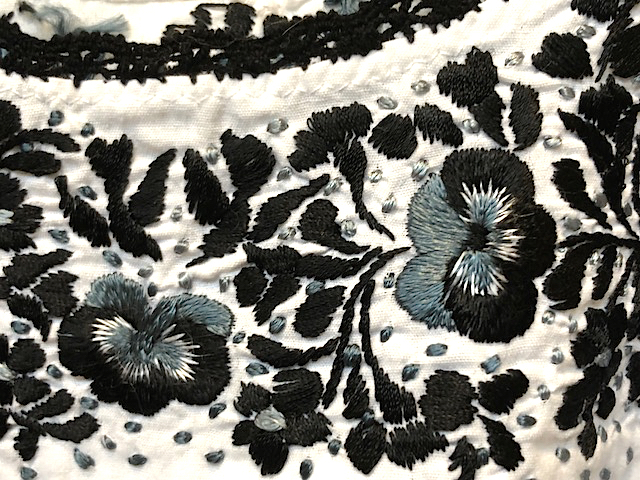 This is an intense and time-consuming process, much more complex and expensive than using aniline (chemical) dyes. 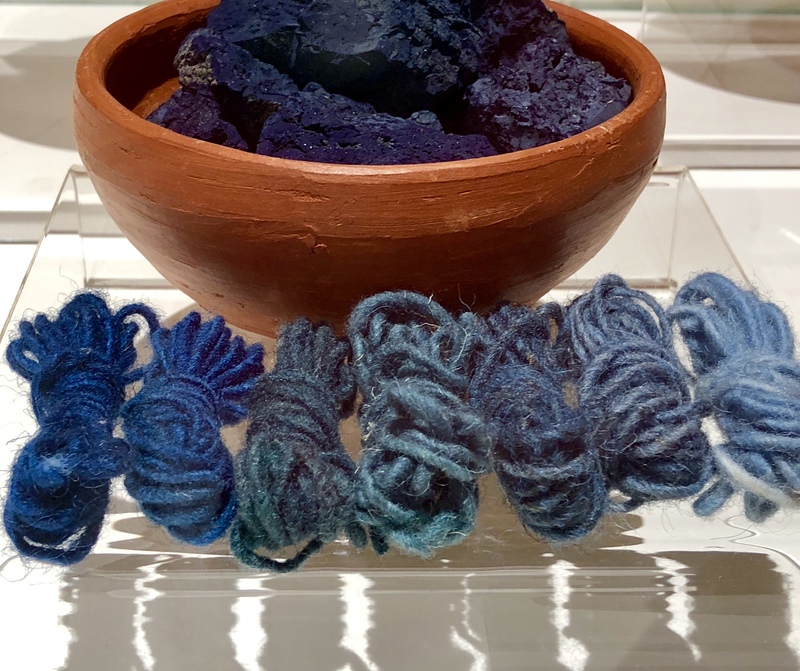 Only about a dozen families in the village of 6,000 people work in natural dyes, though many more know how to give the demonstration. 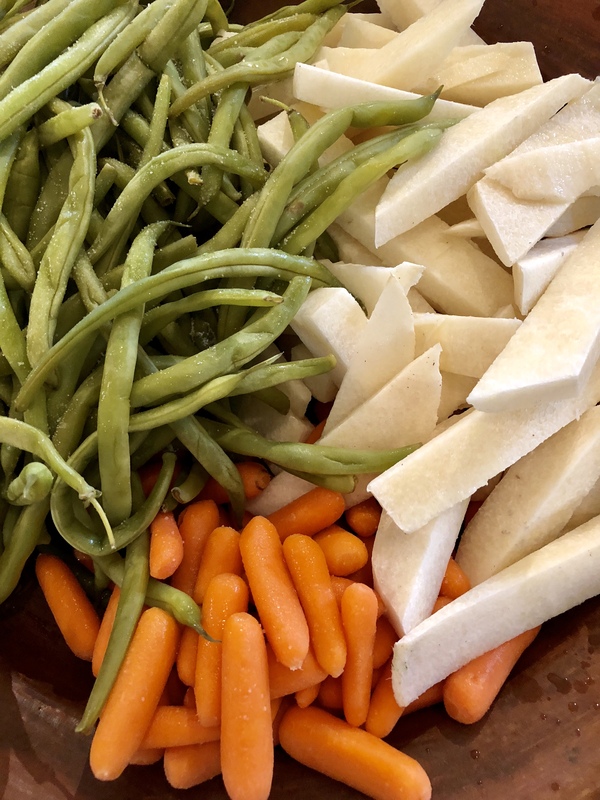 We took a break to go to Arte y Seda for sopa de guias lunch. Que rico! Visitor Hours: Quien sabe? Who knows? 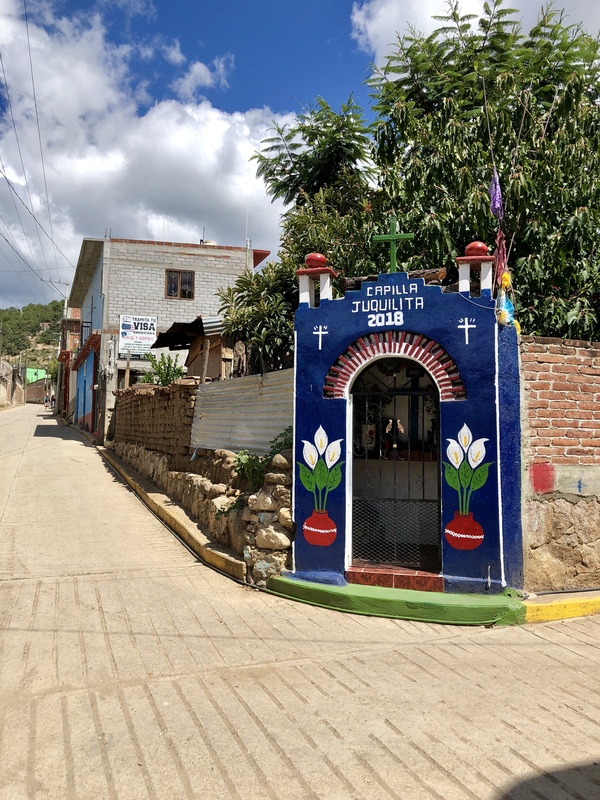 I’ve been privileged to live with a Zapotec family in this village for thirteen years. I live on their land in a casita that I built that will revert to the family when I no longer live here. 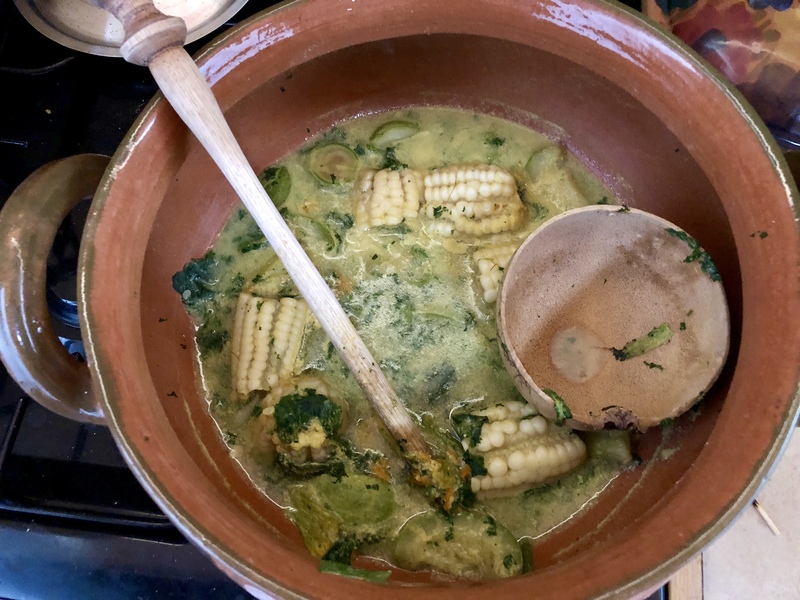 This is also part of usos y costumbres traditions. No foreigners can own land here. We have no written contract. Our arrangement is based on our word of commitment to each other, that we call trust. A model for how the world might be. Thanks to everyone for your generosity! 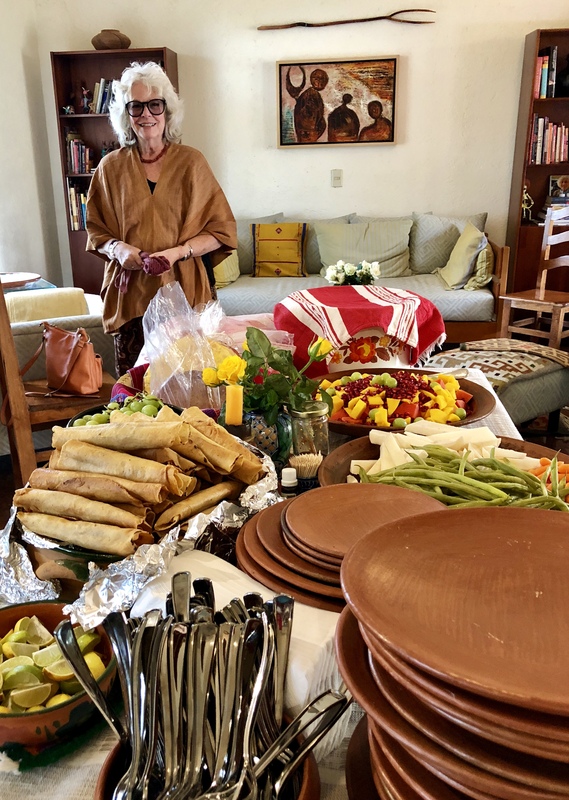 Yesterday’s fundraiser to support the Teotitlan del Valle Spay Neuter Clinic was a huge success. 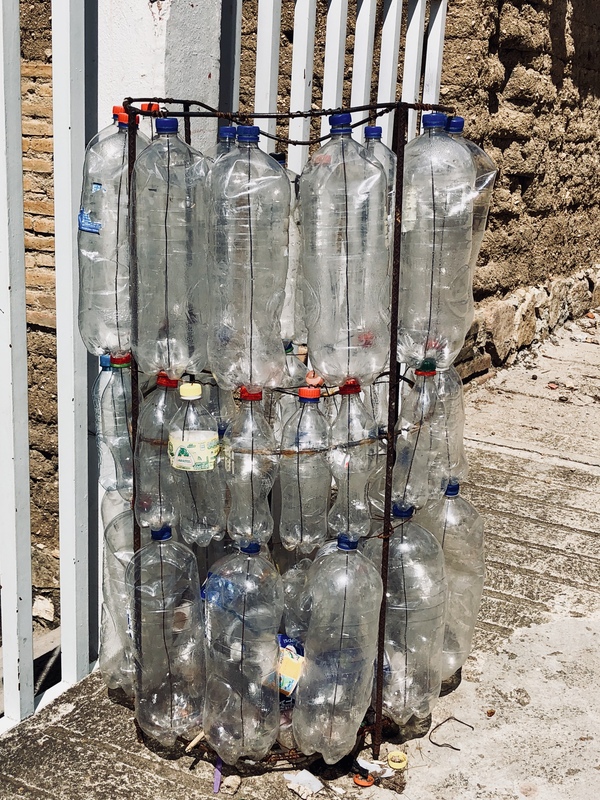 We raised over 8,000 pesos through local donations and 10,000 pesos from antique and collectible sales from Merry Foss’ bodega. Plus, I’m calculating that an added $485 USD came in via online donations through PayPal from friends who were unable to be here. This totals about $1,438 USD. 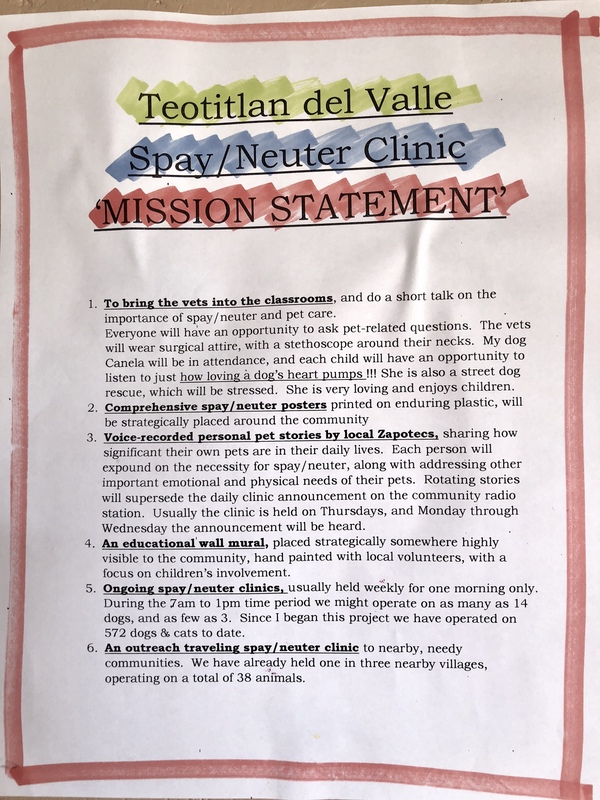 This covers a lot of sterilizations for dogs and cats here in Teotitlan del Valle, plus enables Merry Foss to start a more comprehensive education program about why it is important to spay/neuter animals. 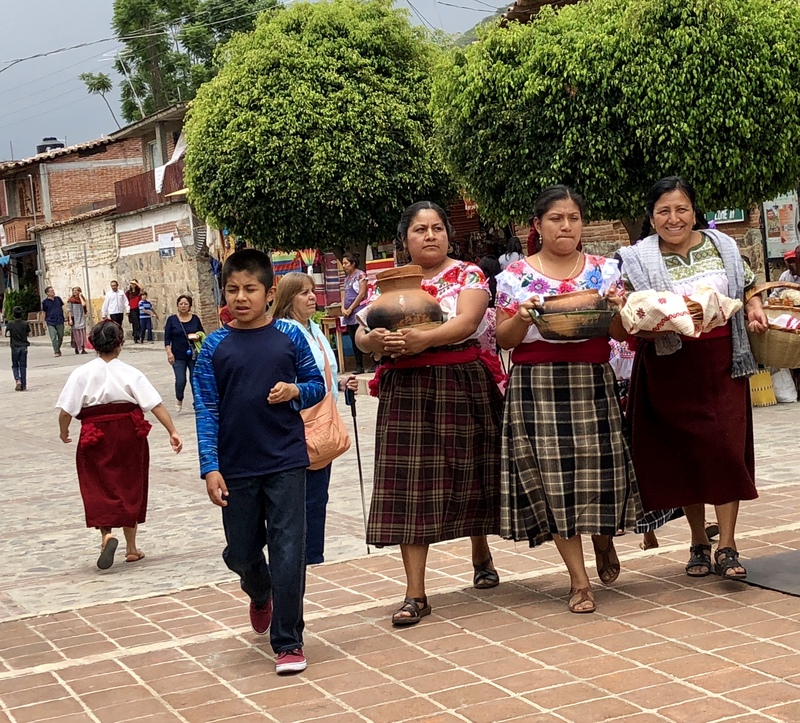 Even with the threat of rain and eventual sprinkles, about 30 people came from Oaxaca City and Teotitlan del Valle, plus other nearby pueblos of Tlacochuaya and Huayapam. Some we knew and some we didn’t! It was great to have this show of support. 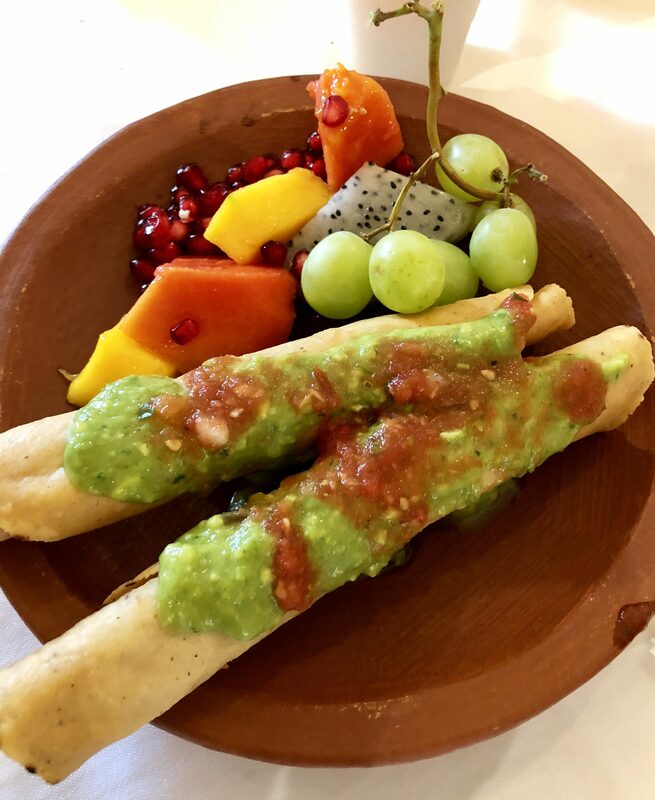 We enjoyed Rosario’s handmade flautas de papas — the homemade organic tortillas were filled with a spicy potato puree, pure yum. 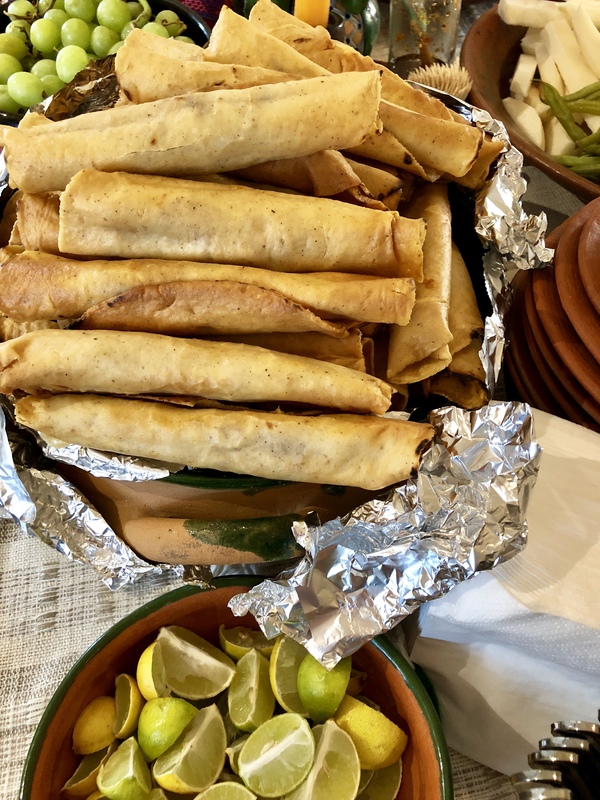 Ernestina crafted 50 black bean tamales flavored with an avocado leaf, plus 125 tamales with chicken and yellow mole sauce. Not much was left! I provided the food. Guests brought their favorite beverage. I’ll have another fundraiser party for the clinic in January 2019. I’m grateful to Merry for what she does to improve quality of life for animals and people here in our village. And, the service allowed me to easily sterilize the dogs I call pets: Mamacita, Butch and Tia. My right hand person, Rosario!